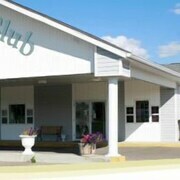 Situated in Lacombe, this hotel is 1.8 mi (2.9 km) from Lacombe Golf & Country Club and 10.8 mi (17.4 km) from Ellis Bird Farm. Where to find Lacombe hotels near an airport? 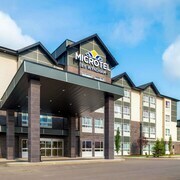 Where can I find hotels in Lacombe that are near tourist attractions? 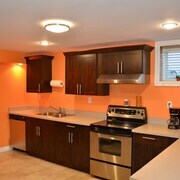 If you are hoping to book a room near the center of Lacombe, there are several options. Lacombe features 3 accommodation options within a 0.1-kilometre (0.1-mile) radius of the downtown area. If you want to stay within 5 kilometres (3 miles) from the middle of Lacombe, The Honeyberry Inn B&B could be an excellent option. 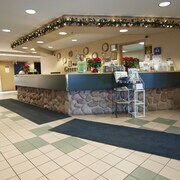 30 kilometres (19 miles) from the main part of Lacombe, is the Holiday Inn Hotel & Suites Red Deer South. Alternatively, the Best Western Plus Red Deer Inn & Suites is 25 kilometres (16 miles) away. 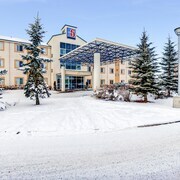 The Comfort Inn & Suites Red Deer and also the Holiday Inn Express Red Deer are some other hotel options around Lacombe. Like to travel a bit further afield? Central Alberta offers many things to see. Spend time at Central Alberta's old towns, archeological sites and nature museums and admire the region's forests. Adventurous visitors can try snowboarding and skiing here. 25 kilometres (16 miles) from Lacombe is Ponoka, where you can find the Ponoka Community Golf Club and the Fort Ostell Museum. If you'd like to spend a night or two in Ponoka, check out the Canalta Ponoka and Stampeder Inn. 25 kilometres (16 miles) to the southwest of Lacombe is Red Deer, home to the Sheraton Red Deer Hotel and Ramada Red Deer Hotel and Suites. The Kerry Wood Nature Centre and the Heritage Ranch are popular places to experience when you're in Red Deer. Camrose is located 85 kilometres (53 miles) away from Lacombe. While you are in the area, you may wish to investigate the Mirror Lake Park, the Camrose Golf Course and the University of Alberta Augustana Campus. The Camrose Regional Exhibtion Grounds and the Camrose & District Centennial Museum are also worth checking out. 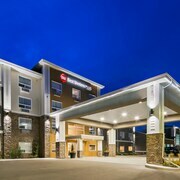 The Canalta Camrose and Ramada Camrose are a couple of Expedia-listed accommodation options in Camrose. Edmonton International Airport is a convenient airport for Lacombe travelers, and is 95 kilometres (59 miles) away from Lacombe. 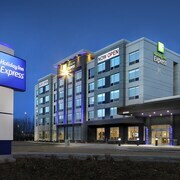 Expedia-listed hotels close to Edmonton International Airport are Best Western Plus Denham Inn & Suites and Ramada Edmonton International Airport. What are the most popular Lacombe hotels? 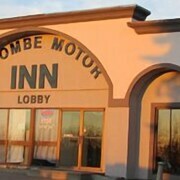 Are there hotels in other cities near Lacombe? What other types of accommodations are available in Lacombe? Explore Lacombe with Expedia.ca’s Travel Guides to find the best flights, cars, holiday packages and more!